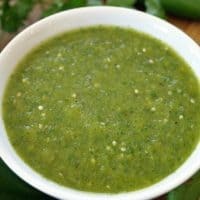 This homemade salsa verde is my take on this delicious roasted flavored salsa that is great to eat with tortilla chips or add to your favorite Mexican dish. 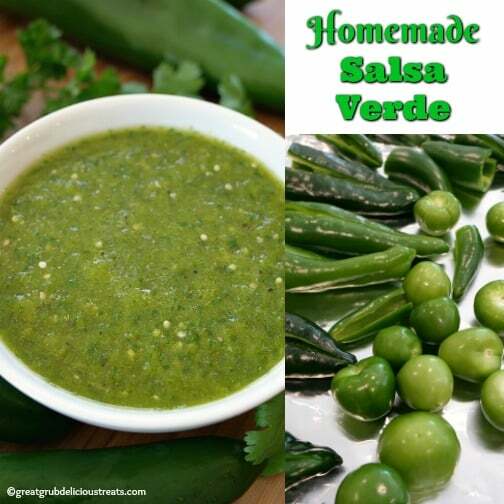 Making homemade salsa verde is so much better than store bought. 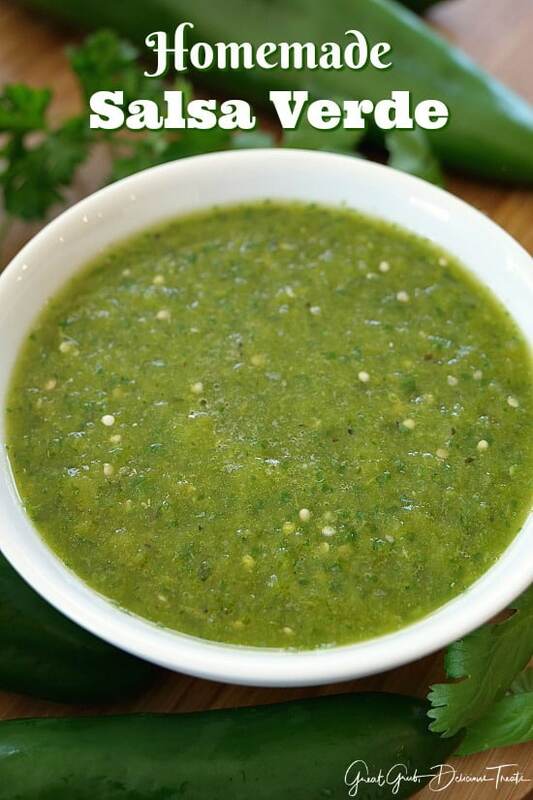 Using fresh ingredients, this salsa is better for you too, meaning no additives or preservatives and the flavor tastes delicious. Roasting the peppers is super easy. These peppers can be roasted in the oven, like I’ve done with this recipe, and they can also be roasted individually holding them over the flame on a gas stove. I actually like the oven method a lot better because all of the peppers can be done at once, especially when you are pressed for time. I will usually use gloves when handling all the different peppers. Just cutting these and removing the seeds the “heat” could be smelt. So gloves are a good way to protect yourself from the juices of these delicious peppers. Just a word of caution, I make this all the time and I didn’t use gloves when making this batch and even after washing my hands, when I touched my eye, I had to go flush my eye with water. But, if you do not have gloves, make sure after you slice the peppers open you use a spoon to scrape out the seeds so as little contact with the skin occurs. 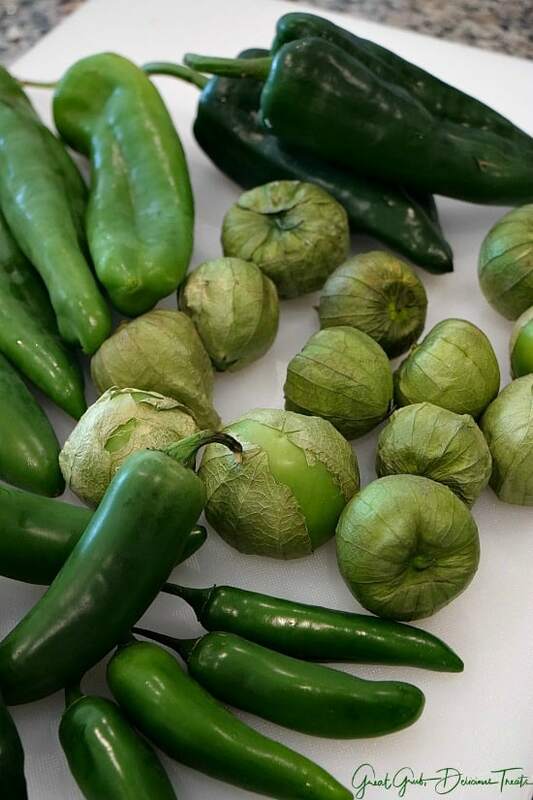 Start out by removing the outer skin from the tomatillos. 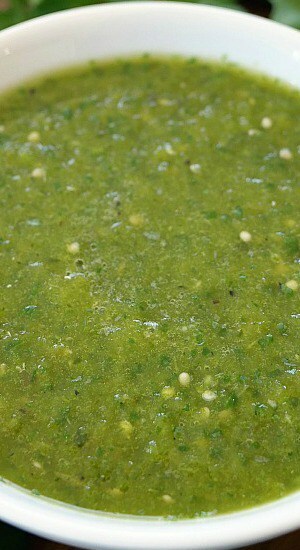 Rinse and rub all the stickiness off the tomatillos and place them on a baking sheet lined with foil. Rinse and cut off the stems from all of the different peppers. Cut in half and remove the seeds. Place peppers on another baking sheet lined with foil and place both baking sheets, one sheet at a time, in the broiler for about 7-10 minutes, turning a couple of times. Once the skins have turned blackish and blistery, remove from oven and place the peppers in a large baggie. What the baggie does is hold in the steam. It makes removing the skin from the Pablano and Anaheim peppers a lot easier. 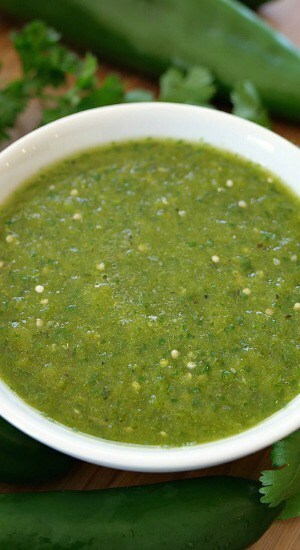 Add the tomatillos to the Vitamix or blender and then add the peppers. Next add the garlic, cilantro, seasoning and juice from the lime. Blend until smooth and pour into a bowl. Cover with foil and then place in the fridge to chill. The salsa will thicken up as it cools. Enjoy with tortilla chips or top your favorite Mexican dish. Here are a few more delicious Mexican recipes that can be found on the blog: Shredded Beef Enchiladas, Mexican Style Crock Pot Chuck Roast, Beefy Taco Goulash, Rib Eye Street Tacos, Crock Pot Spicy Charro Beans, plus many more. Line a baking sheets with foil, spray with a non stick spray. When ready to roast the peppers, turn oven to broil. Use two baking sheets if needed. Remove outer skin, rinse and rub the stickiness off the tomatillos. Place on baking sheet. Cut off stems, remove seeds from all the peppers, and cut in half. Rinse and place on foil, skin side up. 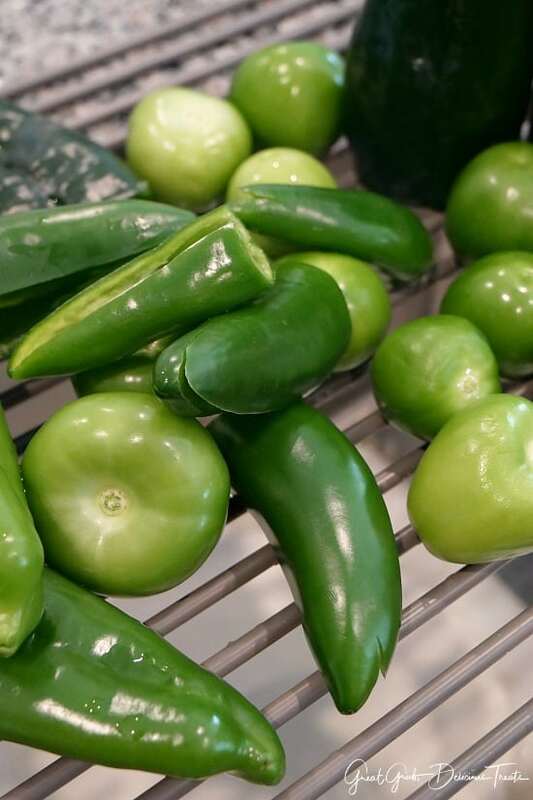 Keep some of the seeds from the serrano or jalapeños to add additional spiciness, if desired. Broil on high until skin turn blackish and bubbly turning a couple times during broiling (approximately 10 minutes, give or take). 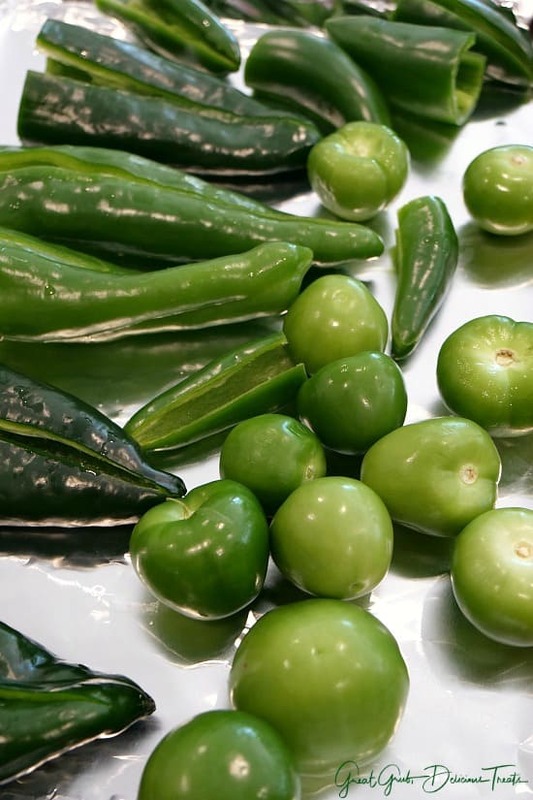 Once skins are blistery, remove from oven and place tomatillos, jalapeños and serrano peppers in a Vitamix or blender and place Poblano and Anaheim peppers into a large baggie and seal. After about 5-10 minutes, remove/peel skin off peppers and add to Vitamix or blender. Add cilantro, onion, garlic salt and juice from one lime. Blend until there are no chunks. Chill and serve with tortilla chips or top your favorite Mexican recipe like, tacos, enchiladas, burritos and enjoy. I recommend wearing gloves when cutting and removing the seeds from the peppers.